The Venice airport, Marco Polo, is situated 273 km from Pula. The second Venice airport in Treviso is situated 282 km from Pula; in both cases there is a driving time to Pula of about 3 hours. From both airports there is a frequent airport bus; to the Mestre Railway station in Venice travel time from Marco Polo airport is 20-30 minutes, from the airport in Treviso about 1 hour. From the Mestre Railway station there are train and bus connections to a large number of cities in Italy. By Car, as mentioned, car drive from the Venice airport to Pula takes about 3 hours. Expect for 15-20 km before the Slovenian/Croatian border that there is highway end to end. On the highway in Italy and Croatia toll fee applies. At the Venice airport you can rent a car from majority of the well known car rental brands, normally it is not a problem to bring the car to Croatia, but make sure to ask anyway. You can check the current car rental offers available from the Venice airports here. Transfer, for a small number of people a transfer is obviously a relatively expensive way of travelling from Venice to Pula, but if you are a group of 6, 8 or more people a pre-booked transfer is for sure a travel option to consider. Here you can check prices and pre-book a transfer from the Marco Polo airport and here you can see prices and pre-book a transfer from the Treviso airport. Bus, from the Venice bus station there are two daily direct buses (expect Sundays). Timetable for the buses you can find here. To catch either of the buses in Venice, you will have to take the airport bus from either of the airports (Marco Polo, Treviso Airport) to Venice. Train, from the Mestre railway station there are frequent trains to Trieste, from Trieste you will then have to continue the travel with either bus, rented car or pre-booked transfer. Plane, there are no direct planes between the Venice airports and the airport in Pula which means that flying would require minimum one hub, in most cases several hubs. The bottom line from a time perspective, flying is not an option. Boat / Catamaran, venezialines operates a catamaran between Venice and Pula. During main season (July and August) the catamaran has daily departures, outside of main season (April- June + September-October) there are 2-4 weekly departures. 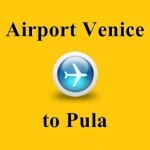 Feel free to leave a comment below if you have any questions about travelling from one of the Venice airports to Pula. My wife and I will be arriving at the Marco Polo airport at 11:20am on Tues May 5. I would like to take a ferry to Pula the same afternoon I arrive, but not sure about ferry schedules. Do you have any idea about the ferry please? What might be my other options to get to Pula on May 5? I am travelling as part of a party of 3 for the outlook festival & will be arriving at the Marco Polo airport at 18:25pm on 31/08/16. I would like to take a ferry to Pula the same evening I arrive, but i’m struggling to find any availability. If this is a non-starter, What other options are there to get to Pula on 31st August? do to your arrival time, I doubt you will be able to catch any catamaran from Venice at that day, probably your best options is to take train from Venice mestre to Trieste and them from there on travel with bus to Pula. Do you know what the best way to get from Trieste to Stinjan would be? Any help would be great!